Wasn’t supposed to stay here for as long as I did. Not even close. But every day i’d tell myself i’d go catch a bus to my next destination and every night I was stay up way too late having way too much fun. One of the best Hostels i’ve ever been for sure. Couldn’t recommend more. 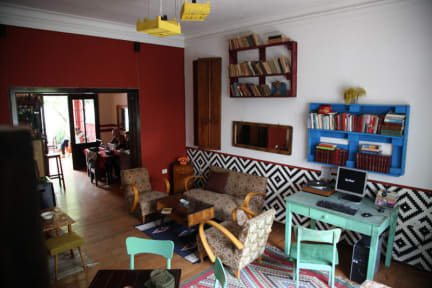 It's hard to find a hostel as good as this one in any city or country. The facilities are great, the hostel has a really nice atmosphere and the staff are very friendly, welcoming and helpful. You MUST stay this hostel! Could not recommend this hostel enough! All of the staff and Erion were amazing - so friendly, helpful and gave great recommendations. Hostel was clean, great atmosphere, location and lovely breakfast (get the French toast with homemade jam!). Definitely one of the best hostels I've ever stayed in. Thank you! This hostel was really great. Orget helped us out hugely when one of our group lost the passport (even helped us with the Albanian police). He went way beyond what was required to help - great guy! Also great atmosphere and local beer was top quality, as was Wes the bartender. Location is ideal too. Overall amazing experience great staff, great city, great breakfasts. Friendly staff, nice atmosphere, great breakfast and good price. The best hostel I've stayed at, period. Loved this hostel! I wish there had been more of a social atmosphere but I was traveling in March - I bet it gets really fun and rowdy in the high season. The staff was super helpful and the location is perfect. Definitely a nice ambience. Enjoy! It was a nice hostel for the price. The staff were really helpful and good to talk to. The free breakfast was made to order and pretty nice.